This year our family has been faced with many dragons. Even though sometimes the battles have been bloody we have made it through and can truly say we have grown in many ways. One of the many things I love about Waldorf Education is all the wonderful festivals and celebrations and today’s was no exception. It’s a day when everyone (grown-ups included) gets to be a super hero :). Of course the festivities began last night with the bedtime telling of The Most Beautiful Dragon in the Whole World from The Festival of Stones by Reg Down. The Little’s love this story and it was carried over into today’s play. After breakfast clean up the day was kicked off with a walk around the block and back home for circle time. The Little’s acted out ,for the last time, the Michaelmas Fingerplay they have so been enjoying this month. Then it was time for me to tell the story of St. Michael helping Sir George defeat the dragon and save the beautiful princess from certain death. I told the story written by Mrs. Marsha Johnson that is in her files. Since we would not be able to make dragon bread this year we decided to make clay dragons instead. We used the modeling clay recipe found here. We will finish painting them tomorrow. Next we brought out the watercolors and painted the dragons fiery breath. Then said good-by to summer with a big bowl of ice cream (Something that we can still have 🙂 ). We will finish today’s celebration with the beautiful story that Christine Natale wrote for bedtime. Wishing Everyone A Happy Michaelmas ! Wow ,when its time for autumn here in Indiana its autumn. With temperatures in the 60’s, when just last week there was record temps in the 90’s ,it makes it really hard to concentrate on work (or to get up out of a very warm bed). SO guess what Mama (and our alarm clock dog) over slept this morning? I told myself ,I just must have needed the rest after a beautiful weekend spent outdoors and tried to get the day started the best I could. I am just happy that Miss Sky still enjoys playing (and creating)with dolls even though her 10th birthday swiftly approaches and I am in no hurry to see it end any time soon. For breakfast I made pancakes and Papa put together some chili in the crock pot for tonight’s dinner since I was running a bit behind. We didn’t have circle this morning but went on a walk around our neighborhood instead. We took notice how the leaves are beginning to fall and change colors. We also took a pen a paper with us to write down the street names we passed to map out for today’s main lesson. We took closer notice of things like if the streets were flat or hilly and if they were straight or curved. We also measured out the distance around the block, how many different ways we could walk it , and which way was the longest and shortest route. 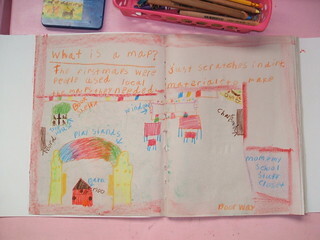 We noticed that we live on the main street that connected all the other streets together. Next we counted how many fire hydrants there were to place them later on her map. We also have a creek that runs through our neighborhood and took notice where it goes. I hope to find a map of how the creek runs through our whole town. Once home I helped Miss Sky map out all the information we acquired in her MLB. We have an interview with our neighbor this week who is an original resident of our neighborhood. They were one of the first couples to have their home-built here (in our neighborhood which came much later after our city was established). At the time it cost them $20,000 to have their home-built and are of the few lucky ones to experience home ownership. Miss Sky and I came up with some questions she would like to know about our town for her interview. This weeks spelling list contains 18 words with the majority being from last week. We marched , kicked and moved our arms while spelling them out. Next Miss Sky printed them once and wrote them once in cursive in her MLB. This weeks running form drawing reminds me of a crown for Michaelmas. She traced it with her finger then practiced it in the air first with her right hand then her left. We finished with Miss Sky reading to chapter 8 of The Little’s Give a Party. I read to chapter 7 of The Bears of Blue River. I am ending my post with a with a blast from the past, how many remember this song :). Wishing everyone a great start to their week ! I thought with this weeks festival approaching I would post a beautiful story Christine Natale left in my comments last year. There Is No Crying In Homeschool ! Well unless Mama does a very bad thing :0. Yesterday was our catch up day, we run errands and do other things around the house that might have been neglected during the week. Well with the crazy summer our family had I finally got around to gathering all of Miss Sky’s work from third grade and filed what I wanted to keep. When out of nowhere Little Sis rounds the corner in a sea of tears. “Mommy I can’t find my lesson books !” Not understanding what she meant I said it’s ok they are in your desk. “No mommy my other books like sissy’s, they are missing.” (Oh boy) Now it is true I give Little Sis her own MLBs so she can “do” school like sissy. In all fairness I do keep a lot of her work but Little Sis tends to have pack rat tendencies and wants to keep everything. SO while cleaning out her desk before the start of the school year I think I threw away her lesson books. Now how on earth was I suppose to tell a very distraught little girl her” mother” threw away her very precious lesson books that she did not even know were missing until yesterday? Um I didn’t I simply replied “Are you sure they are not in your desk?” Then proceed to leave no corner of the schoolroom unturned in order to find these precious books. Meanwhile ,knowing we were not going to find them, I tried to calm her down with “You know , you can always make new ones this year in case we can’t find your old ones”( OMGoodness big mistake). “But I worked SO hard and you have a bunch of sissy’s stuff, IT”S NOT FAIR.” Oh yes her new favorite words to say ,I was busted. All I could do was sweep her in my arms and try to dry her tears(without telling her the truth). 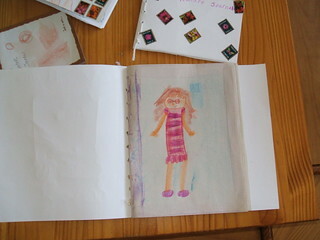 We talked about her drawings , and about how silly sissy is , and our dog Harvey, and ice cream. Which lead to “you know mommy I would feel better if I had some ice cream” oh thank goodness for the invention of ice cream. Well as of today the ice cream must have worked because there has been no mention of her lesson books. I am hoping since all of Miss Sky’s work is now put away that all is well in the world, but I am bringing in a plan B just to be safe :). I have also made a mental note to self Do Not Throw Away Little Sis’s Lesson Books This Year ! and are getting really excited about Michaelmas. Miss Sky and I have also been enjoying our “rhythm sticks”(just walking sticks Papa made for us). While saying Miss Sky’s memory verse we have come up with a beat. For the first beat (Yellow the bracken) we tap the sticks on the floor (I thinks it helps that we don’t have carpet). Then for the second beat (Golden the sheaves) we tap our sticks together. Then tap on the floor for the third beat and cross again for the fourth beat , but this time cross the sticks on the opposite side. We keep this rhythm all through the verse and get faster each time we go through it until we mess up. It is very meditative. Next we headed into the schoolroom for Miss Sky’s spelling test. She has struggled with quite a few words this week and I just gave her the test to see how she would do. I think we will work with 18 words instead of 20 this year and will repeat the words she had trouble with next week. I also asked her to give me her vocabulary words in a sentence. She did good with this and then she put this weeks form in her MLB after practicing it first with her left hand on the board. It was then time for plan B , making cookies. OK I will be honest here, I am feeling really guilty for using Pamela’s products(pancake and waffle mix) for all of my GF baking ,these cookies included. It’s like I am cheating or something using a mix and not making it from scratch even though I am making it ( I know). It’s like using Bisquick to make biscuits instead of measuring out the flour ext. We have managed to go the whole week without any (loaf) bread and I have gotten really good at making biscuits (like in less than 5 minutes) for breakfast. I don’t know it just feels weird. Then to have my whole family rave at how these are the best they ever had, like my cooking before was terrible is not helping matters. Even though it’s only been 2 weeks it seems like we have a lot more energy than before. Papa also wants me to thank everyone for the Tinkyada pasta recommendation (spaghetti is his favorite meal),now to find a good pizza crust recipe and Asian cookbook and I will be set. We called it a day with Miss Sky reading to chapter 6 of The Little’s Give a Party and I read chapter 5 of The Bears of Blue River. This was a very hard chapter to read. Our family has a soft spot for wolves , Big Sis and her boyfriend want to have a refuge for wolves someday. We are in no way against hunting for food but to kill an animal just for the skins. In all fairness we did talk about how at the time that was their “money ” to trade for food, there are always 2 sides to every story. It was just really sad to read. I do think it is good to read stories that you might not always agree with, they make you think 🙂 and grow. Wishing you all a very good weekend ! You know with all the festivities of the weekend I forgot to mention the 50% off sale at Goodwill. I actually start looking forward to the sale as each new season approaches. I can’t help it , that is where I buy 95% of our curriculum for the year. Then there are times when I have to really retain myself (so I don’t get kicked out of the store)like when I found this dress. OMGoodness it even had a handmade by tag inside. I am sure some of you may have noticed my girls ,most of the time, don’t ware the usual attire most children do. Um there is no such thing as “dress up” in their vocabulary. They think everyday is a good day to ware something frilly. With this dress I can’t blame them. So what does one do with all those books they accumulate from the Goodwill sales they attend (especially when they live in a really small space)? Have a very sweet and loving husband make shelves going around the top of the schoolroom :). Have I mentioned we like books? Oh the first day of autumn, tradition has it in our home to start the day off with the reading of The Apple Cake by Nienke van Hichtum then to go into the kitchen and make an apple cake for breakfast. 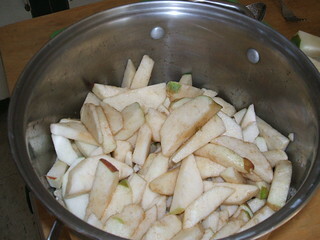 Well I have not been able to come across a gluten-free recipe for apple cake yet and was starting to get a little gloomy when I found a recipe on Pamela’s products website for pumpkin bread. It wasn’t apple cake but it was a pretty darn good substitute. Let’s just say there are no left overs. It’s funny how food revolves around so much more than just nourishing our bodies. I was also glad to find GF tamari because chicken fried rice is a staple meal in our home, in fact that is what was on the menu for tonight’s dinner. While Miss Sky did her math I made the rice and chopped my veggies and chicken(left over from another meal)to be ready for tonight. Miss Sky has got all her problems right 4 days in a row, and even though workbooks are taboo in Waldorf Education it has helped so much with our school day. Yesterday’s lesson was all about our house. We reviewed where we left off in third grade with measurements talking about inches, feet, and yards. Then I explained that a mile is 1,760 yards. I explained how most traveling distance is measured by miles. Then we measured how many yards, feet and inches her bedroom and the front room where from the schoolroom. She finished her ML page from Monday. Today we went outside and measured the distance between our house and the neighbors and Miss Sky made a page in her MLB. We also talked about our address. Even though Miss Sky knew our address we talked about the importance of having one. I also broke it down to explain what each part meant. Then we talked about what a zip code was. She should be able to tell me which part of speech they are and use them in a sentence by Friday. She practiced this weeks form on the chalkboard with her eyes open then with them closed. I always know she has the form down when she can draw it with her eyes closed the same as when they are open. Miss Sky finished her book yesterday and started The Little’s Give A Party by John Peterson. I read to chapter 5 from The Bears of Blue River. I have to say Miss Sky is really enjoying this book and it has started many conversations. I think we may be doing a study on black bears very soon. Wishing everyone a happy autumn ! With such a busy weekend I decided to let the Little’s sleep in as long as they needed. I knew our school day would not be to heavy and thought it would run smoother with everyone well rested. I also received some very sad news yesterday that one of my cousins was killed in a car crash. He was only 25 years old. I say this only because this year I am trying to teach myself not to sweat the small stuff. I tend to make mountains out of mole hills if you know what I mean. It’s not something that I am proud of . Being choleric it is just who I am, but I know it doesn’t have to be. It will just take “a lot ” more conscious effort on my part. So that being said, I am trying to take a more relaxed approach this school year with The Little’s. If we can’t do circle time oh well the world won’t come to an end. It is about enjoying our time with each other that matters. I learned that while Papa was in the emergency room 3 weeks ago. Once The Little’s woke up I made waffles (from Pamela’s mix) and sausage for breakfast. Deciding to try out our new no-bake rice pasta noodles, and having everything else already made in the freezer, I made lasagna for our dinner while Miss Sky did her math. Next we started circle keeping with last weeks line up and practiced with our penny whistles. Then we headed into the schoolroom for main lesson. Reviewing our directions from Friday I asked Miss Sky which direction was her bedroom from the schoolroom, and which room was west of the schoolroom. 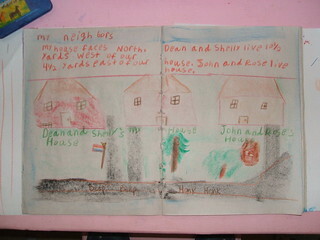 Then working together (me with my own MLB) we mapped out that part of our house. Tomorrow we will add to the map by reviewing some of our measurement lessons from last year. She printed them once in her MLB then wrote them in cursive once. We are practicing more running forms for form drawing to help with Miss Sky’s cursive this year. We did this weeks form in the air then in the air with our eyes closed. We finished with reading Miss Sky is now on chapter 9 of The Little’s Take a Trip, and I read to chapter 2 of The Bears of Blue River by Charles Major. Oh yes and Miss Sky is still working on more felt animals for handwork. She is getting quite good. Wishing everyone a very happy Monday ! As part of our geography block I thought it would only be fair while learning all about this great state we live in ,to actually “see” why it is so great. For starters I thought we would pay a visit to where the author of our next book grew up. (I printed a map of Indiana off and as we visit places we will put a push-pin through the town.) There was a pioneer fair going on at their fairgrounds. First stop was school. I have to say the “knowledge” that filled this room was worth the whole trip alone. Not only did the Little’s enjoy a day at prairie school. I learned SO much myself. This room was filled with every type of handwork you can think of and even some I had never heard before like tatting, and chicken scratch embroidery. I am most excited to put my new knowledge to work. Today we packed up and headed out to the country fair. Only this was no ordinary fair. We saw the bearded lady, a soothsayer,a lady with tattoos all over her body, and a 6 foot man-eating chicken. But that was not all. They had a Sorghum Mill,hayrides,and pie eating contests (that we could not participate in).The Little’s shucked corn and got to grind it up . Papa enjoyed his time there too. Yes more classic cars. I think we all agree, we really like this place we call home. Now to kick back and relax as we start another week of school. Well we have almost made it through our first week of being gluten-free. I have taken some wonderful advice and instead of focusing on what we can no longer eat, we are focusing on all we can. I have to say we are enjoying every minute of it. We also have discovered Pamela’s Products (www.pamelasproducts.com) baking and pancake mix. OMGoodness we all agreed this made the best pancakes we have ever had gluten-free or not. After breakfast The Little’s started on their workbooks. I have noticed such a difference in Miss Sky already. The Kumon workbooks are made to give the child confidence and it sure has. You should have seen her face today when she got all her problems right. She was beaming with excitement all day. They also finished up a project from yesterday. Yes a cage for their “pet” hamster. When all the morning chores were done we headed out for our walk and came home to start circle. Today for main lesson I read page 19 from Maps and Globes by Harriett Barton and we talked about the four basic directions. Using our bodies as a compass I asked Miss Sky which direction was the ceiling, the floor, the chalkboard, and other things from around the schoolroom. Then I asked which direction was her desk from the window ext. Miss Sky made her picture in her MLB. 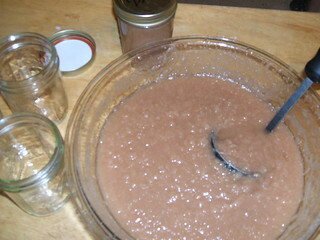 and applesauce. Man this made the whole house smell good. While all this was cooking Miss Sky read to chapter 7 in her book and we finished Ozma of Oz. To my surprise Miss Sky is really enjoying our main lesson so far. Next week we will be adding spelling and grammar back to our lesson. Wishing everyone a wonderful weekend ! Well we are on day 3 of no gluten (yes I am keeping track). My dad (hi) who is also gluten-free says it will take 3 months before we will notice a difference. Since today was skating we decided to pay a visit to our heath food store. Man has it changed since my dad took me as a child (I loved watching people make peanut butter). After already craving pizza you could only imagine my surprise when I saw how much a gluten-free pizza was. So we picked up some gluten-free tortillas that were made with brown rice flour,and on sale, then came home to make our own GF pizza. They passed the Little’s taste test and I am getting a few more recipes under my belt. I know one thing this change in our diets has brought to our attention just how much bread our family eats and how many more fruits and veggies we need to eat. Yesterday after our circle, which is a big hit Little Sis is loving the Michaelmas fingerplay and we have to do it several times before we can move on, we started the main lesson. I read the first 12 pages from the book Maps and Globes by Harriett Barton and we talked about how the first maps were made and the materials different people used. We talked about that Native Americans and why they might have needed to use maps. 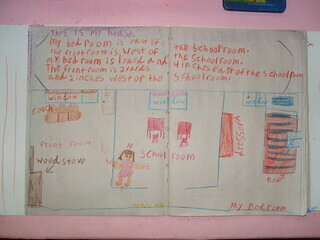 Then Miss Sky made a map in her MLB of the schoolroom. We finished with Miss Sky reading the next 2 chapters of The Little’s take a trip and me reading Ozma of Oz. I have to say we honestly (as of yet) could not tell you which is our favorite story in this series. Unfortunately we will have to take a break from the land of Oz after this book to get started on our school books. Today with all the activities we kicked back with some handwork while listening to Thornton Burgess’s Animal stories on audio book. We finished our backpacks with a little embroidery. And Miss Sky is still adding to her animal collection only this time I think she is giving me a hint. Um as of right now a hamster made of felt is about as far as she is going to get o ne as a pet :). Little Sis also joined in the sewing action. With some dot to dot sewing cards. I am thinking this would be a great handmade gift idea for Miss Sky to make some more for her birthday. Many blessing for the rest of the week. Well the day had finally come, time to head back to school. I now have to get in the habit of saying fourth grader and kindergartener. Of course in Waldorf education the word kindergarten is quite different from the mainstream, but the title helps to ward off certain people who wonder how my children can possibly be learning when they are always outside ;). I would be lying if I said we could not tell a difference but everyone agreed they were really good. I also made a loaf of gluten-free (GF) bread for today’s lunch using the kit from king Arthur. This almost takes the fun out of bread making for me as my favorite part is the kneading, but I am sure I will get the swing of things. We are going to try to eat only one loaf of bread a week compared to my 3 loaves I used to make( I have a kid that really likes PB&J).We all agreed it is weird eating white bread even though it really isn’t white flour, I have heard about brown rice flour and maybe that will help with the color. But on to school, after breakfast while I was cleaning up the Little’s started on their workbooks. Yes I did say workbooks, after much research I have found workbooks that I really like. http://www.kumonbooks.com/home/index.aspx What I like is each book contains one math topic at a time and by grade. In Waldorf you only introduce new math topics during your math blocks, so I bought grade 3’s workbooks for Miss Sky to practice her math while we are not doing math blocks. This will just be reviewing what she learned last year. I also like that these workbooks are made for the child to check and fix their answers themselves. They also have preschool books that are great for Little Sis (they make her feel like a big girl but do not ,in my opinion, bring her out of her dream like state). Besides I couldn’t stop her from learning if I wanted to, this is a child that is going to teach herself to read. Workbooks isn’t the only thing I have for Little Sis while Miss Sky is doing her work. This made her whole day. She has school “stuff” (play-doh with shape cut outs, do-a-dots with lots of paper, bean counting game from family math, a pack of pipe cleaners, puzzles,and a few of her favorite books)just like Sissy. After clean up and chores it was time for our walk than circle. We have a new gathering song this year. Then with the idea I got from Mrs. Marsha Johnson we took our walking sticks and pounded them on the floor at the beginning of each line of the poem Yellow The Bracken Golden The Sheaves. We ended with tongue twisters and a review of songs on our penny whistles. We are starting the fourth grade year out with 1 block of Geography. I gave the Little’s their new backpacks for our “travels” and The Little’s decorated them with fabric markers. We will be putting the finishing touches on them tomorrow. I purchased them through http://www.dharmatrading.com/. 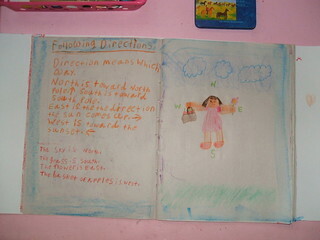 We also made our nature notebooks to carry along on our adventures. Next Miss Sky and I reviewed our shelter’s block from last year and taking the idea from Our Little Nature Nest we talked about how our bodies are our first home and Miss Sky drew a picture of herself on the first page in her MLB. After lunch we finished our school day with reading. Miss Sky read the first 2 chapters of The Little’s take a trip by John Peterson. I am finishing Ozma of Oz by L.Frank Baum. Wishing everyone a great start back to school !